Every fish is unique and perhaps that’s why fish are so fascinating. Looking through some old photographs recently, I was reminded of the lessons different fish have taught me about angling (and my addiction to it). Although I have never really believed “fishing is life,” I have grown keenly aware of the pleasure fishing brings and how it depends on many of the same things that help us live fulfilling lives- patience, problem-solving, compassion, enthusiasm, tolerance, planning, self-reliance, endurance… In that respect, fish and the simple act of fishing are compelling. Looking back on all the time I have spent fishing, these are a few fish that I have found to be strangely influential. For years black drum were a puzzling enigma to me. Early on, I confused their wiggling tails at twilight with those of redfish. Black drum had a habit of luring me farther from the boat on sunset wades with their bold antics, only to ultimately deny me the satisfaction of catching one. They were picky. It was a game that inevitably left me frustrated, confused, and really not liking black drum too much. But then on a sultry afternoon I encountered a large school of drum in very clear shallow water, where I could actually see what they were doing and watch how they reacted to my flies. It was a real eye-opener. For years I assumed the key to catching black drum relied on casting some sort of special fly (which I clearly did not have). But that afternoon I dropped fly after fly under those black drum’s noses and watched them bite with authority, teaching me that correct presentation (not a secret fly) was the missing link. Black drum almost comically illustrate the point that presentation of the fly is often far more important than the fly itself. For more than 20 years I have been afflicted with striped bass fever. There appears to be no cure. These powerful fish are nothing short of wonderful to catch on fly tackle… when you can catch them. I have diligently fished for striped bass on Canyon Lake near my home in New Braunfels for over a decade, and only recently began consistently catching them. It has been a long but enlightening road. Stripers are fish that will make you check your watch and your graph often. They will show up early, late, and sometimes not at all. Stripers will call you out in the fog, and sleet, and rawest of weather with a promise often left unfulfilled. You can cover miles of water looking for stripers, check every promising cove and point, waste hours staring at your graph, change flies a dozen times, and then find out when you arrive back at the boat ramp the stripers were feeding all afternoon… right in front of the dock! BUT… you accept all the denials and no-shows and mood swings stripers dish out, because when a big one does finally blast your fly, he’ll rip the line right through your clenched hands and struggle against you until you finally set him free. No doubt, you’ll be back the next day to chance it again. Like few other fish, striped bass test your patience, endurance, and will to succeed. The first saltwater fish I ever caught on fly tackle was a ladyfish. We stumbled on to a large school of them surfacing at the Port O’Connor jetties. I had brought along my fly rod and it was “game on.” At that point in time, the biggest fish I had caught on fly tackle were stock-tank largemouth bass. Bass were fun, but these new slender chrome saltwater rockets were different… wilder… faster… stronger. I’ll never forget the feeling of pure elation as I cast to those hungry silver bullets and watched them whack fly after fly. It was nothing but excitement and standing on the bow of that boat with a fly rod and a big smile on my face I didn’t care if I ever caught anything else. To this day, catching ladyfish still represents the pure reckless joy of fishing. They’ll slap your fly and jump and run and usually throw the hook before you get your hands on them. And it’s best that way, because the ladyfish’s real gift is the smile it puts on your face. Most of us move on from ladyfish to bigger badder quarry. But every now and then, especially when things are slow, catching a feisty ladyfish will make you feel like a kid again and remind you why you started fishing in the first place. Few fish leave an impression like jack crevalle. Watching a school of jacks ravage baitfish is like watching a pit bull in a chicken coop, and when you make the decision to toss a fly at one there is no turning back. When I think of fly fishing for jack crevalle I think, “10 wt…. 30 minutes… pounding heart… sore arms…” They have overwhelming strength and offer no apologies for shredded flies and busted rods. I would wager that jacks have destroyed more tackle and whipped more fishermen than any other fish on the Texas Coast. Jacks are the kind of fish that you take on because no one else in the boat wants to. In some ways they are almost a rite of passage. I know plenty of adrenaline junkies that lust after catching jack crevalle on fly tackle, and a few others who have hooked one just to say they did it. Kudos to the jack crevalle for reminding us we really aren’t as young or as tough as we’d like to think. Regardless of what you think about gar, you have to admit they are pretty cool fish. Tough, armored, prehistoric, giant, and racked with a mouth full of nasty teeth… gar are unique. Most of us can recall our first angling encounter with a gar, and some of us have continued to fish for them. Of the gar species, allligator gar get the most press time because of their size and looks, but pound for pound, longnose gar are far more gamey. So why would anyone deliberately try to catch a gar on fly tackle? Well, the big ones are strong… really strong. And, they are challenging to hook and land with standard flies. If you throw a kayak into the mix things really get interesting, I also suppose some of us fish for gar for the same reasons we catch snakes and spiders or other strange creatures that can inflict a nasty wound- they’re kind of creepy and we like that. 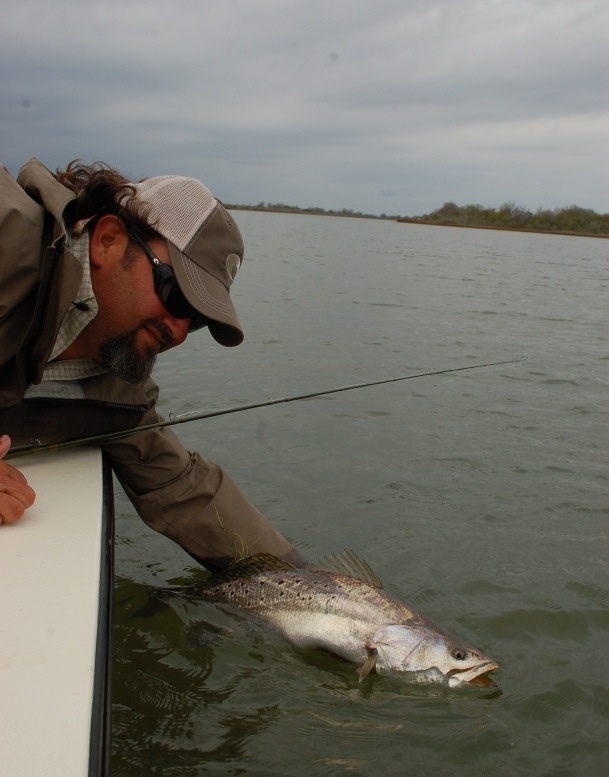 I never quite understood the cult of fishing for trophy speckled trout… until I saw one. We were fly fishing in the Padre Island surf when a friend of mine waved frantically for me to come over. As I approached he lifted a nearly 30-inch-long speck out of the froth in the wade gut. A small gold fly dangled from its mouth like a piece of jewelry. I nearly fell over. At that moment I understood how a trout could drive economies, shape fisheries policy, and make heroes out of guides who knew how to catch them. A second experience a few years after the surf trout also left its mark on me. I was casually walking back to my boat after a morning wade. The weather was pleasant and the winds were light as I sauntered along in ankle-deep water. Up ahead I could see an old black post stranded in the shallow water near the bank. As I approached, I suddenly realized it was not a post at all, it was a massive trout with its back exposed. Like no fish I have ever seen, that trout made my knees shake and almost made me forget how to cast. My fly landed about a foot ahead of the trout and she casually swam up and took a swipe at it. I jerked the fly away in haste and she blazed off the flat at lightening speed. I was speechless, shaken, and will never forget the feeling. To this day I have only caught a few trout I would consider “trophies,” and I remember each of them clearly. They are magnificent creatures. Maybe one day I will get to try my hand at some of the salt water fish. I too, like stripers. I catch them in arizona. Lake Pleasant has some big ones. I really like the picture of the Gar.